Kankakee is a flag stop on the route of the City of New Orleans route and it is also served by the Illini and Saluki. This two-story red brick depot, a former Illinois Central Railroad station, was built in 1898 to replace the original 1853 wood structure. The depot became dilapidated in the 1970s and 1980s, leading to the city’s purchase of the building from the Illinois Central in 1990. After unsuccessful attempts to open restaurants in the depot, the city completed a full restoration in 1998. Private donations and $750,000 in city funds were used to restore the depot, and the project cost $1,000,000. The station was restored to its original grandeur and now stands as a symbol of the city’s revitalization. Care was taken to ensure the historic feel of the building would be preserved. On the second story, the original frosted glass windows inscribed with the names of former railroad officials remain. The depot was added to the National Register of Historic Places in 2000. 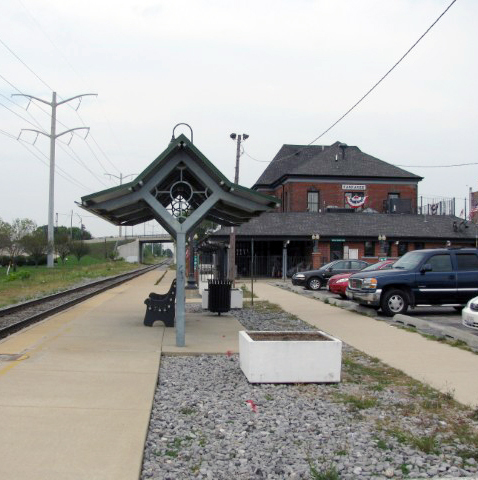 Amtrak, city offices, and the Kankakee Railroad Museum are all located in the depot. Opened in 1999, the museum features model railroad displays, a beautifully restored 1947 Pullman coach, railroad memorabilia, and a scale model representing the city of Kankakee in the 1950s. A 1967 Union Pacific caboose and an original Kankakee streetcar are under restoration. The plaza surrounding the depot has been transformed as well. A fountain was added in 2006, followed by Clock Tower Park in 2007. Today, many concerts and events take place here. Kankakee shares its name with the Kankakee River, which flows through Kankakee County. The Potawatomi Indians who lived in the area called the Kankakee River the Theatiki, and through changes in pronunciation, Kankakee evolved. Theatiki has many meanings, including wolf, wonderful land, and swampy place. American settlers came to Kankakee in 1834, two years after the government signed the Treaty of Camp Tippecanoe. The city of Kankakee grew in the shadow of a nearby French settlement, Bourbonnais. Kankakee, however, became the seat of Kankakee County. The city of Kankakee was the first place to serve Dairy Queen soft-serve ice cream. On August 4, 1938, a small ice cream store called Sherb’s advertised all-you-can-eat ice cream for 10 cents, an amazing offer during the Great Depression. 1,600 of the desserts were purchased. The owner of Sherb’s, Sherwood Noble, soon opened the first Dairy Queen in nearby Joliet, Ill. Today, the Dairy Queen chain is internationally known. Two Frank Lloyd Wright houses epitomizing Prairie-style architecture are located in the Riverview section of Kankakee, the B. Harley Bradley House & Stable and the Warren Hickox House. Notable residents of Kankakee include professional basketball player Jack Sikma, Little Orphan Annie creator Harold Gray, and award-winning novelist Kalisha Buckhanon. Three Illinois governors are from Kankakee.